Late this afternoon Lynch Bages released their stunning 2014 effort. Lynch Bages 2014 is one of the wines of the vintage, scoring 95-96 from James Suckling and 93-96 from James Molesworth, making this one of their truly superb vintages. Lynch Bages was one of the success stories in 2013 selling out overnight despite a score of 89-92 from the Wine Spectator and later 86-88 from Robert Parker. The reason for this was the release price compared to older vintages, Lynch Bages is one of the few chateaux who have consistently priced well for collectors. The 2014 bottle price of £48 is a slight increase of 2.6% ex-London from 2013. However, this is an excellent offering sure to capture the market like last year and sell out immediately, particularly as critics are rating it close to or potentially on par with the 2009 and 2010 Lynch Bages – we agreed when we tasted it from barrel. Lynch Bages is ranked by Harper’s Magazine as the fifth best Estate to buy en primeur over the last ten years. The average ex-merchant release price of €61 rising to an average €83 current market price, a return of 36% across the vintages. Moreover, the average bottle price since 2004 is £67.50, or £810 per case of 12. 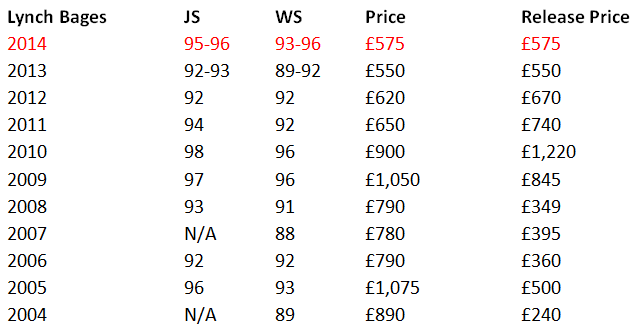 As such the value of the 2014 is evidently clear at £48 a bottle or £575 per case, illustrated by the table below. Lynch Bages rises perennially from barrel to bottle, it is, in short, a wine to buy en primeur for capital appreciation, or to secure one of Bordeaux’s truly superb wines at a lower price: in essence the whole point of en primeur! – We expect this release to sell out on the Place de Bordeaux, it almost always does. Lynch Bages resonates with all fine wine buyers, it has a strong traditional market in old Europe and the US. It was one of the earliest Bordeaux wines exported to Hong Kong; since 1989 it has been served in the First Class cabin of Cathay Pacific Airlines, the international flag carrier of Hong Kong. Jean-Michel Cazes was one of the first proprietors to promote Bordeaux wines in Asia, travelling there for 20 years and cementing Lynch Bages’ brand globally. Lynch Bages is situated in the small sub-village of Bages, a wonderfully picturesque setting which contains their hotel and museum, as well as a delightful square; this is certainly one to visit. High on the west hill of the Pauillac region, the 90 hectares of vines are planted on deep gravel beds covered with limestone. Lynch Bages, originally classified as a Fifth Growth, is arguably the most dominant member of the Super-Seconds. It is known for combining powerful rich tannins with tobacco and cedar; it takes years in the bottle to exhibit its true splendour, with top vintages capable of ageing for 30-50 years. This has fascinating aromas already with blackcurrants and cassis. Hints of spices. It’s full-bodied with ultra-fine tannins and a long, focused finish. Muscular but toned and beautiful. Offers lovely weight and feel, with a big core of plum, blackberry and black currant fruit that manages to show refinement, while ample charcoal and warm stone notes flow underneath. This is displaying terrific depth and purity today.